Anna Walker and I have now finished our new book, Tilly. We are excited to show it to people soon! It will be published in October 2019. Today (March 4th) is the publication day of another new book, Ivanhoe Swift Left Home at Six. Here’s a picture of it. In the meantime I’ve been working on my novel, As Happy as Here, and it’s all finished as well. It will be published by Hachette in August this year. Lots of finished books! 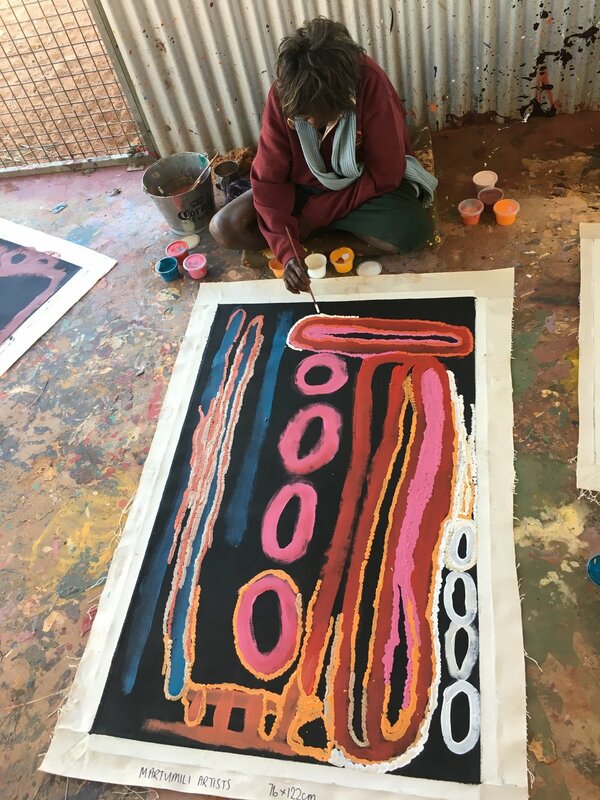 During July, my friend Alison Lester and I travelled to Yiyili, an Aboriginal Community halfway between Fitzroy Crossing and Halls Creek in the Kimberley region of Western Australia. We made books with the kids there, and they did the most fantastic artwork. Here are some pictures from our time there. In August I spent a week in South Australia working with kids in schools there. Then it was back to Melbourne for Bookweek! It was a great week in schools, and I must give a shout-out to the kids at Westgrove Primary School in Werribee who asked me so many great questions and had obviously studied my website because they knew everything about me! They also had some fantastic ideas for stories. Then during the school holidays we made a big ocean mural at The Wheeler Centre inspired by The Silver Sea. Alison and I also made a book called Monster Party with kids at Rawa Community in remote WA and it is published this month. So happy birthday, Monster Party! Also published this month is Watch This!, the photographic picture book I made with Beci Orpin and Hilary Walker. (Scroll down to June/July 2017 to see the photoshoot.) That picture below of all the shaped biscuits is my pre-launch baking! My friends Davina Bell and Freya Blackwood and I also made a book called Birthday Baby and we launched it at The Little Bookroom one evening. That’s us chatting in the picture below. 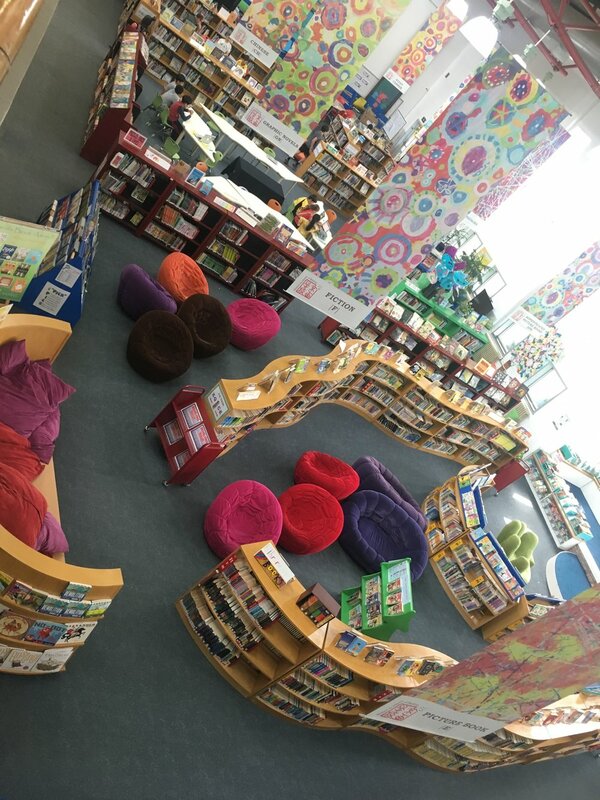 March 2018 was the publication month for Go Go and the Silver Shoes, so Anna and I were out and about doing storytimes and speaking in schools. I wore my silver shoes to all the events, and Anna even made me a special tiny pair of silver shoes to match Go Go's! Some of the pictures below were taken at Squishy Minnie Bookshop in Kyneton, Victoria. The girl in the green school uniform is the real Go Go! I named the character after her. Go Go's real name is Marigold. I travelled to China again and worked with the students at the Western Academy of Beijing. We had lots of fun exploring writing together. I also travelled to Japan, but that trip was a holiday with my daughter Lizzie. Then in April, it was time to publish Red House, Blue House, Green House, Tree House! Jane R and I did a storytime at The Little Bookroom, and then a bit later we went to Balnarring Primary School and worked with the kids there. We even had little mouse pins made that feature the mouse in the book. My daughter Lizzie made a video trailer for the book, too. You can see it here. May was the launch of The Silver Sea at The Royal Children's Hospital in Melbourne. It was lovely to see so many people at the launch, which was a very special event - we even had silver sea cupcakes. I've had my publisher hat on, working with my friend Alison to complete her new book which is called Tricky's Bad Day. It's a very funny story about a Tiger who is having a VERY bad day - until it gets turned around into a good day! 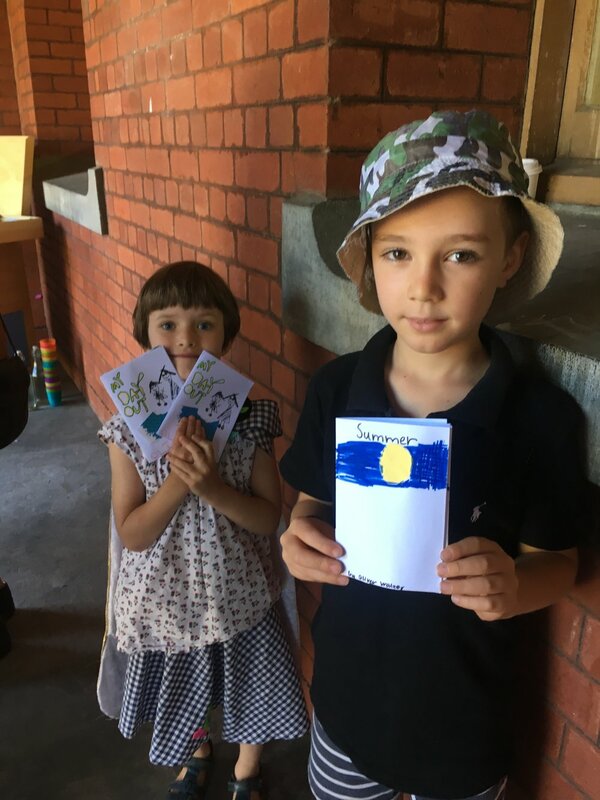 The kids at Heatherhill Primary School in Melbourne have been busily writing stories to submit to Early Harvest magazine, which is an initiative of the 100 Story Building in Footscray. I went along and worked with them - they had lots of great ideas! Abhas asked me to give him a shout-out on my website, so here's your shout-out, Abhas! Anna and I are busy working on our new book together. It's about a little girl called Tilly and it's based on a true event from when I was a child. Jane Reiseger and finished our new book Red House Blue House Green House Tree House! and it went off to the printer as well. The pictures below show Leo, our two-year-old critical reader, enjoying the book (phew! ), and the delighted looks on our faces when we see that he loves it! During October I travelled to Bangkok with GATEways to work in an international school there. It was a great experience and included visiting the Unicorn Cafe (you can see the photo below of me and my friend Colin there). It was a wacky place, and very colourful! I also met lots of great kids and we had fun creating books and writing together. I love their school uniforms and wish I could have one myself! 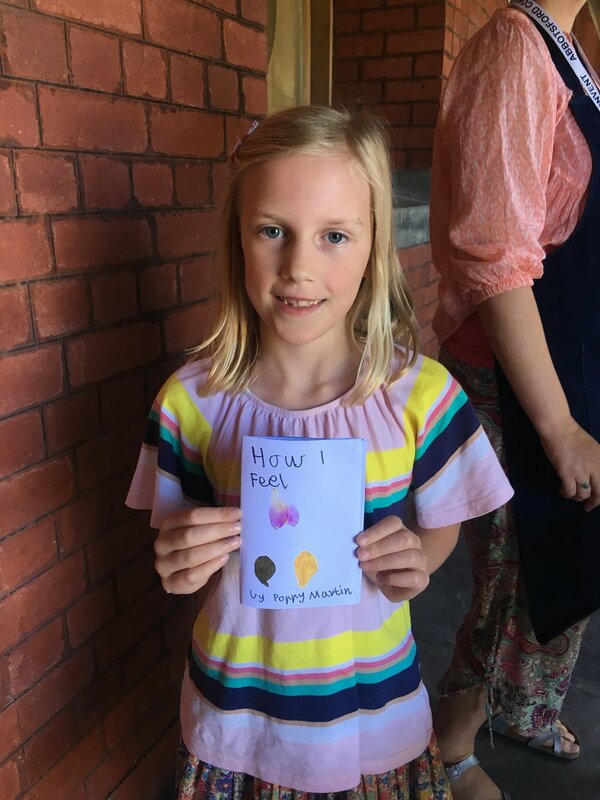 During June I spent a week in Launceston where I visited lots of schools and worked with the students doing creative writing talking about books. Then I went to Canberra where I ran some GATEways programs about writing NONSENSE! We made up funny words and gave them our own meanings. Anna Walker and I have been busy working on our new book GoGo and the Silver Shoes. We've nearly finished it now, and we're about to send it to the printer. It's always nerve-wracking at this point of the process! Here are a couple of sneak-peek pics of the book. We're excited about this one! 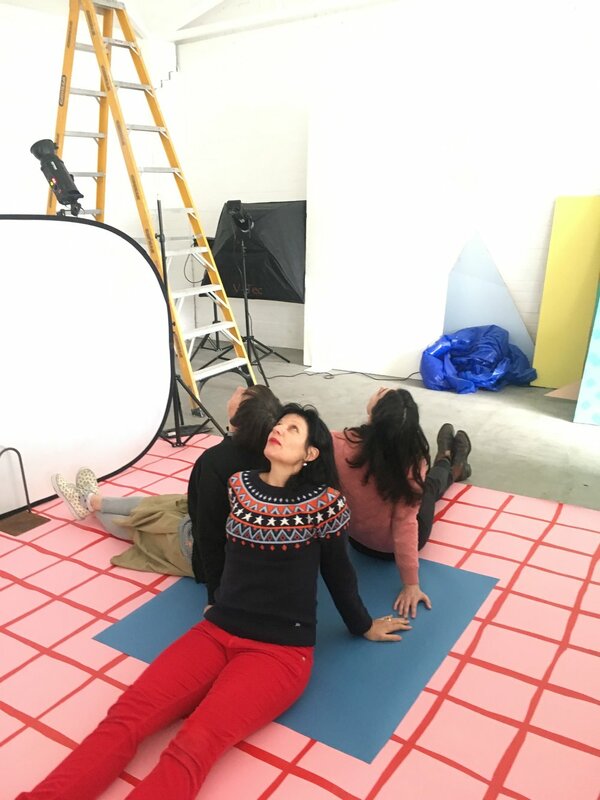 We had a photoshoot for another new book, Watch This! It's all about children making shapes with their bodies. There are 13 children in the book, and we took thousands of photos of them over 4 days in order to make the book. We also painted all the backgrounds in different colours and patterns. Here are some pictures from the photoshoot. In the last picture, you can see all the people involved in making the book - Hilary (the photographer) me, Bri (also a photographer), Miri (the publisher of the book) and Beci, the art director and designer. Now we just have to choose which photos look best for the book! 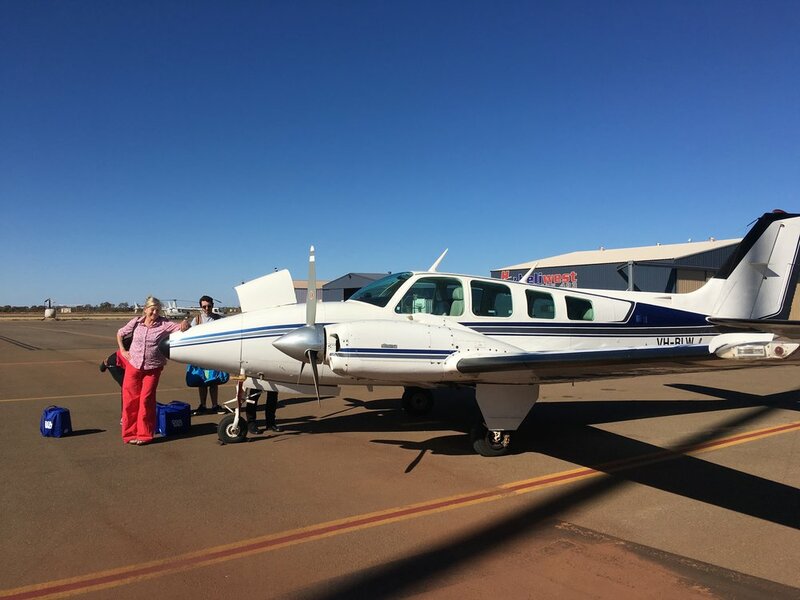 At the end of July, my friend Alison Lester and I went on an adventure to the most remote school in Australia! 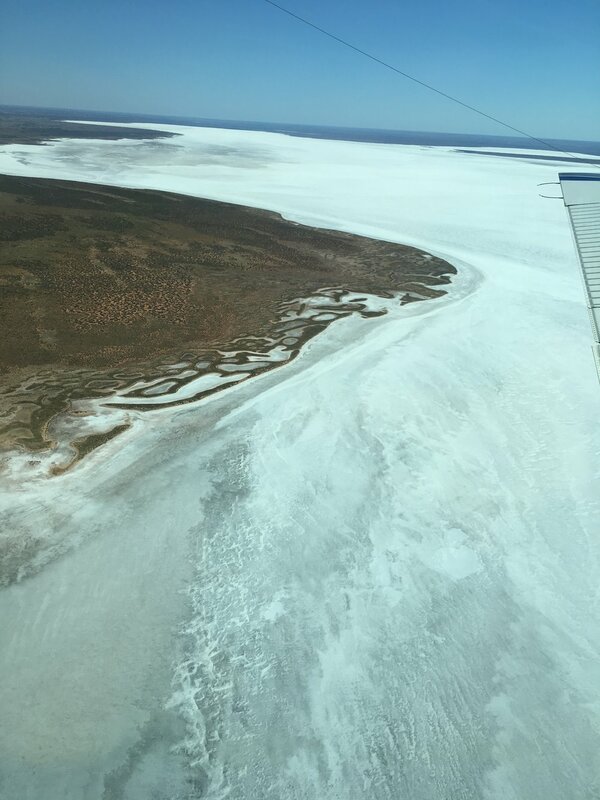 We travelled to the Aboriginal community of Punmu, on the edge of the Great Sandy Desert in WA. We had a great time working with the kids at Rawa School. We made five books with them. The elders in the community also took us to some special places and told us important stories. Alison and I loved our time there. Here are some pictures from the trip. We travelled in a very small plane - a five seater! 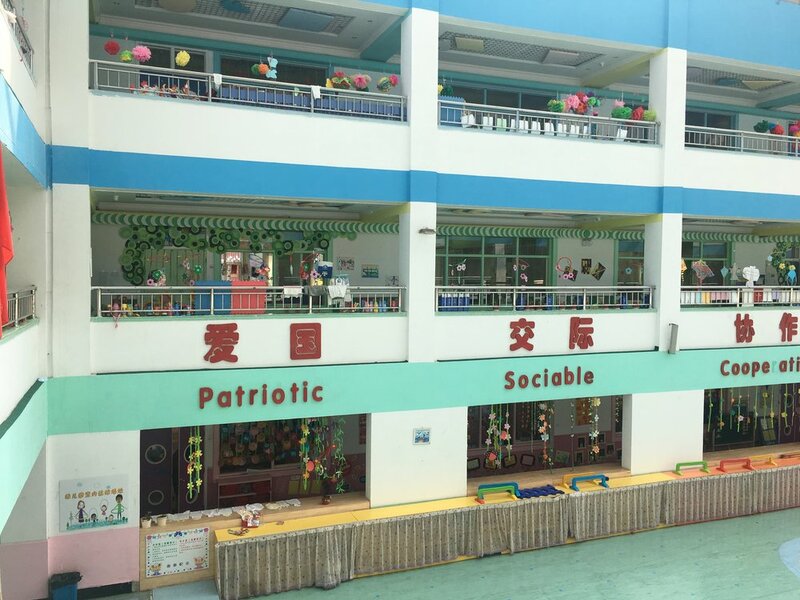 I spent the month of April in China, where I worked with students at international and local schools. Michael and I spent nine days at the Western Academy of Beijing (WAB), which was great fun. We even went on a school camp (specially dedicated to writing) with the senior students, and we slept in a yurt! We worked with every year level in the school. 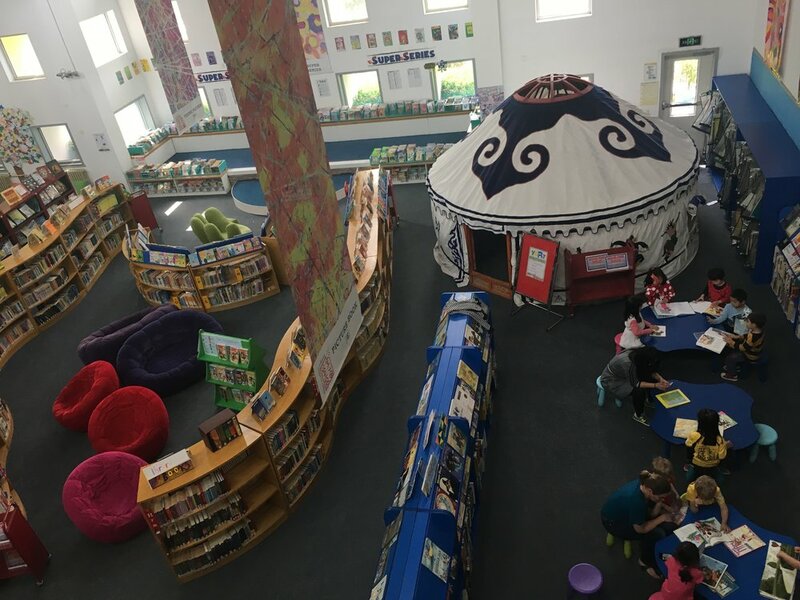 The library at WAB has a yurt as well! The lovely people at WAB looked after us so well and we made lots of new friends. 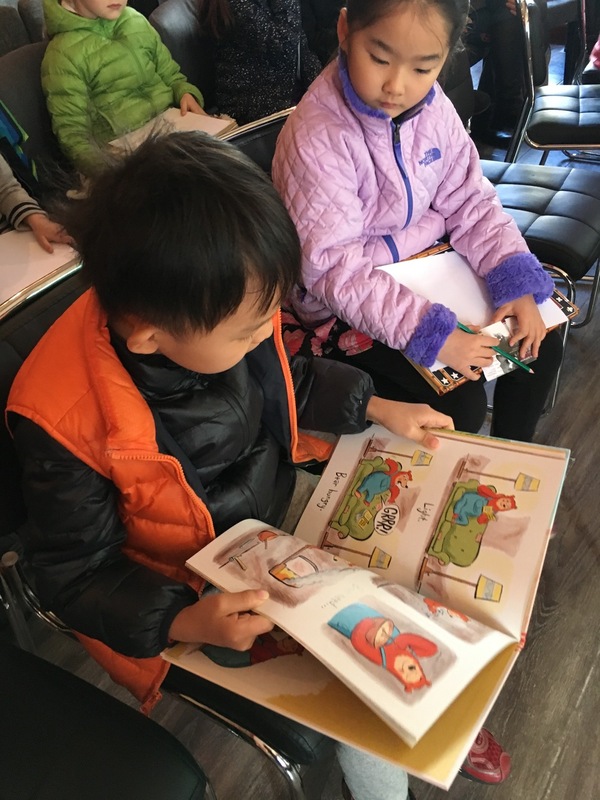 I also caught up with my old friends at Magic Elephant Books, and did an author tour that included Beijing, Shijiazhuang and Xi'an. Here are some pictures of that part of the trip. The kids did some lovely drawings of the days when they have no plans, based on Anna Walker and my book Today We Have No Plans. Now I'm back and catching up on everything here in Melbourne. 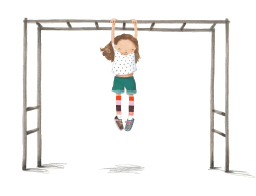 Anna and I are working away on our new book, and I'm planning for school workshops throughout the next term. That last picture is of a shop window. Embiggen Books in Melbourne worked with Anna to create their own Florette window. It looks fabulous! I launched two books in March, actually! The other book is called Under the Love Umbrella, and it's a wonderful creation by two friends of mine, Davina Bell and Allison Colpoys. Here's a picture of the book, and some photos of the launch, which was held at The Little Bookroom in Melbourne. My friend Davina and I also went on a road trip to Wangaratta in north eastern Victoria. We visited Cathedral College and worked with the students there. We had such a great time. Everyone at the school was so friendly, and they were great writers, too! Here are some pictures of some of the students talking to Davina about their stories, and also a picture of some of the cheese we ate when we were there. They make great cheese in those parts! I've been working with my friend Alison Lester on her new book called The Very Noisy Baby. It's a really fun story based on Alison's own granddaughter Beatrix who is extremely noisy! Alison always does a storyboard for her books. You'll see in the picture below that we ticked off each page on the storyboard when Alison had completed it. See all the pink ticks? 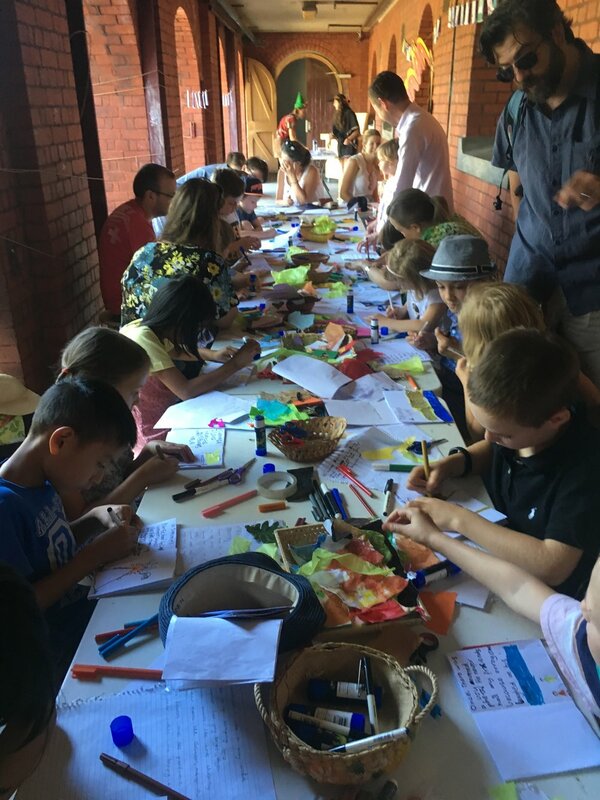 The other pictures above were taken during the school holidays when I ran a workshop with kids at Abbotsford Convent as part of Kids' Own Publishing. 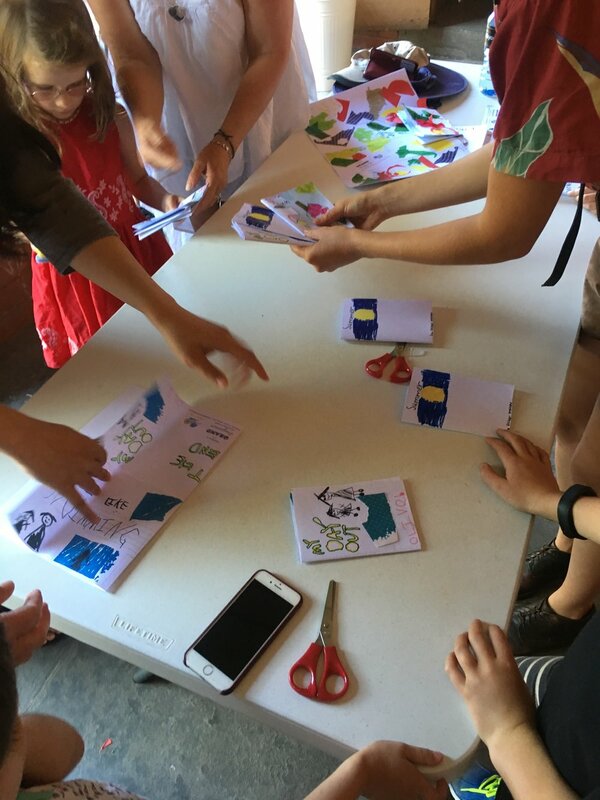 We had a lovely day walking through the beautiful gardens of the convent, then writing our own sensory poetry, which we then turned into little books that people took home with them. It takes such a long time to make a picture book - usually more than one year! - so I am busy working on several new picture books that won't be actual books until next year. Anna Walker and I are working on our new book which is called Go Go and the Silver Shoes. I'm also doing a photographic picture book about shapes with my friends Beci Orpin and Hilary Walker. I've never done a photographic picture book before so it will be a fun and interesting challenge. Jane Reiseger and I are also making a book together which is all about colour. If you've ever been to the Royal Children's Hospital in Melbourne and see all the beautiful artwork on the walls, ceilings, actually everywhere in that building, then you will have seen Jane's work because she did it all. And that red car in the pictures above is painted by Jane, too. During October I read lots and lots (and lots!) of stories for my job as a judge of the young writers' section of the Boroondara Literary Awards. There were funny stories, moving stories, sad stories and intriguing stories - it was hard to select a winner and commended entries because they all had great things about them. I also was part of two videos! One is a film clip for my son Wil's band. The boys in the band decided that it would be a great idea to make a video clip of their new song but instead of them being in the clip, it would star their mothers! So here I am being a rock star for a day! The other video has a slightly different vibe - it was filmed by the lovely people at Storybox Library. Fiona and Shannon came to our house and filmed Michael and I talking about our lives as children's writers. The video will be on the Storybox Library website in a couple of months. During November I also worked with the year three students at Beaconhills College. We had lots of fun exploring storywriting together and the kids did some great work. I also spent time with year 3/4s at Brunswick South West Primary School, where I really enjoyed conducting workshops and discovering how creative and resourceful the students were with their stories. Well done, Beaconhills and Brunswick South West! And while we're on workshops, the Stonnington Literary Festival asked me to run a workshop for adults who write for kids, so I did that and it was an action-packed three hours of writing exercises and me sharing with the participants everything I know about the world of writing and publishing books for young people! I think we were all exhausted by the end of it! A special event occurred in November as well - my good friend Alison Lester was awarded the Dromkeen Medal for outstanding achievement in the creation of Australian Children's Literature. I'm sure everyone knows Alison's books! My favourites are Imagine, Magic Beach and Kissed by the Moon. Oh, and Are We There Yet? Below on the right is a picture of Alison with her medal. The middle picture is a selection of books I've been looking at this month, and the picture of the left is my dear friend Anna Walker looking at her beautiful new book Florette. It's not available yet but it will be in March next year! During September, Michael and I visited Park Ridge Primary School in Rowville, and I also spoke at Ruyton Girls School in Kew. Here are some lovely drawings that kids have sent me, and also a pic of me and Kate from Park Ridge PS. The sea creature stencils and the fabulous turtle are works of art created with the patients and teachers at the Royal Children's Hospital in Melbourne, where my friend Alison Lester and I are making a book with the kids. Oh, and the photo of Bear Make Den? 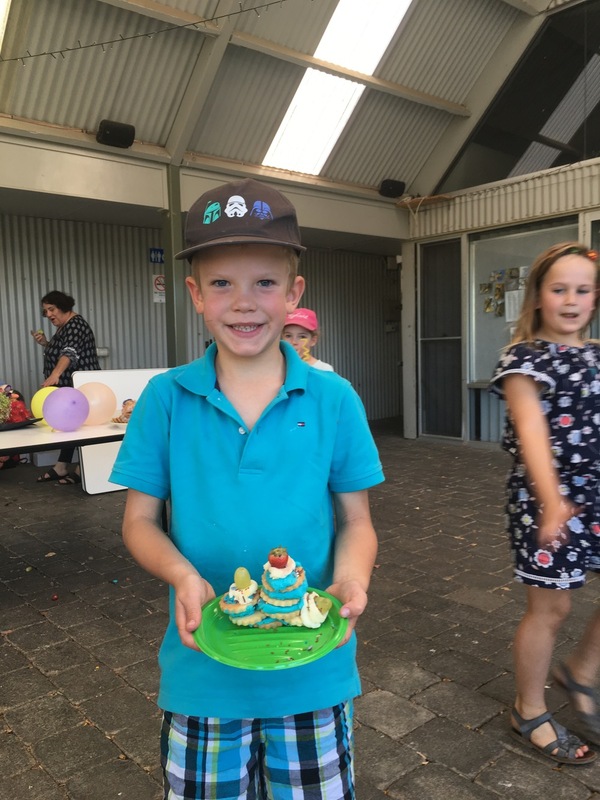 That's Lachlan, who received Bear Make Den as one of his fifth birthday presents - in fact he says it's his favourite birthday present! Thanks, Lachlan! I'm glad you're enjoying Bear Make Den! 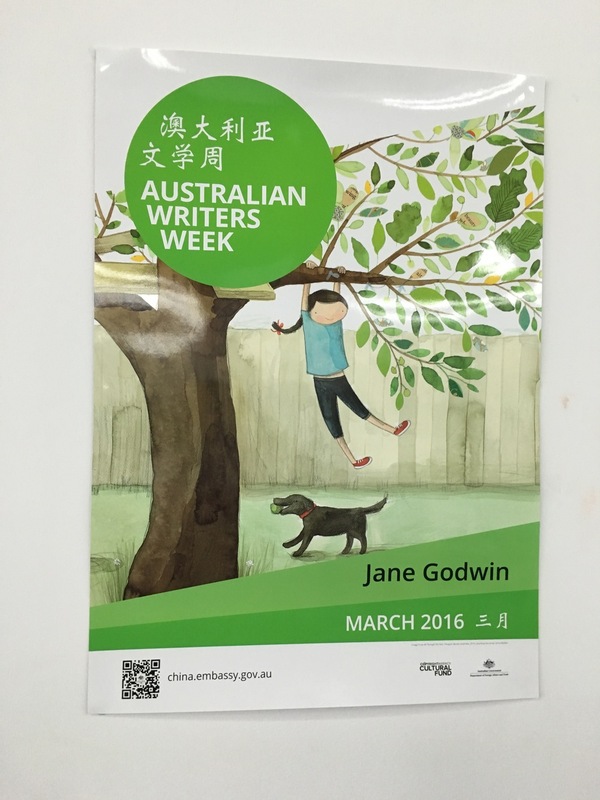 I also spent a week in Tasmania, speaking in schools and doing some work with the Tasmanian Writers' Centre. I had a great time there, and I took some photos of my all-time favourite boat, the Aurora Australis. That's the boat that travels down to Antarctica from Hobart. I also went for a hike up Mount Wellington, which was misty and beautiful (and quite strenuous!). August was a very busy month! The time leading up to Book Week, and Book Week itself, is always full of school visits. I spoke at St Kevins in Ormond, Huntingtower, North Fitzroy Primary School, Canterbury Primary School, Geelong Grammar, St Mary's in Thornbury and Yarraville West Primary School. Also St Pauls in Endeavour Hills and Parade College in Bundoora and Preston. It was a big couple of weeks! I also spoke to students at Melbourne University and RMIT. My talk at Melbourne Uni was on at exactly the same time that my son Wil's band was playing there! For a moment we considered a mother/son double act, but there's a bit too much swearing in Wil's songs so we decided against it. My friend Alison Lester and I are also working with the teachers and patients at the Royal Children's Hospital in Melbourne. We are making a book together. The children are doing all the artwork. The book is called The Silver Sea, and we think it will look very beautiful when it's finished! After all those talks I escaped down to Lorne (a beautiful beach on the Great Ocean Road in southwest Victoria) to finish the novel I have been working on for what seems like 100 years (but is actually about 6 years). I think I'm nearly finished! Here are a few pictures - one of a fabulous bear drawn by one of the children at Canterbury Primary School, one of the interesting Arts West building I spoke at at Melbourne University, and one of beautiful Lorne! Oh, and one that I took today of some lovely wattle on a cliff at Aireys Inlet - happy springtime, everyone! 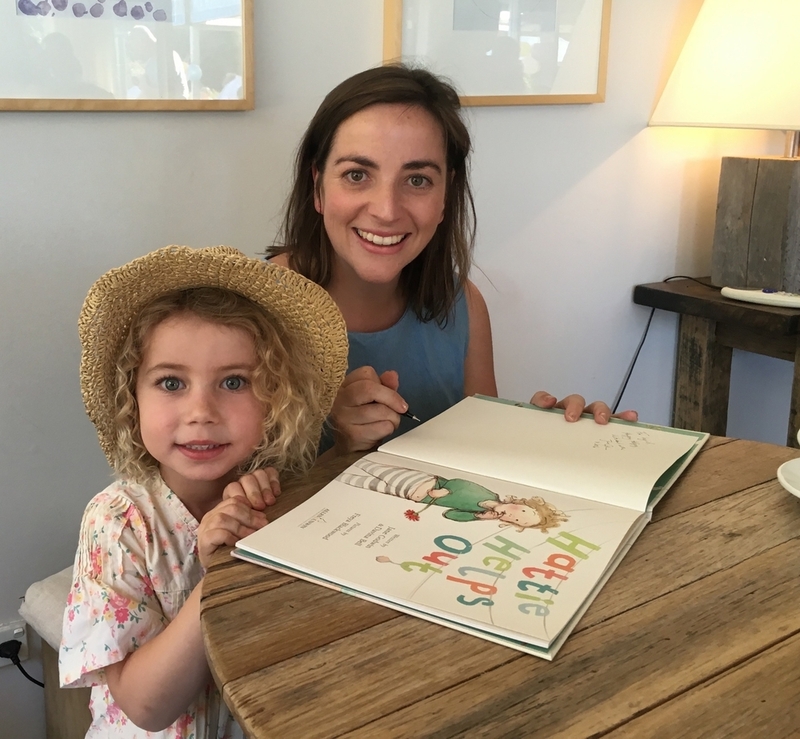 At the end of July, my friend and fellow author Davina Bell and I went back to visit our friend and illustrator Freya Blackwood in her home town of Orange. 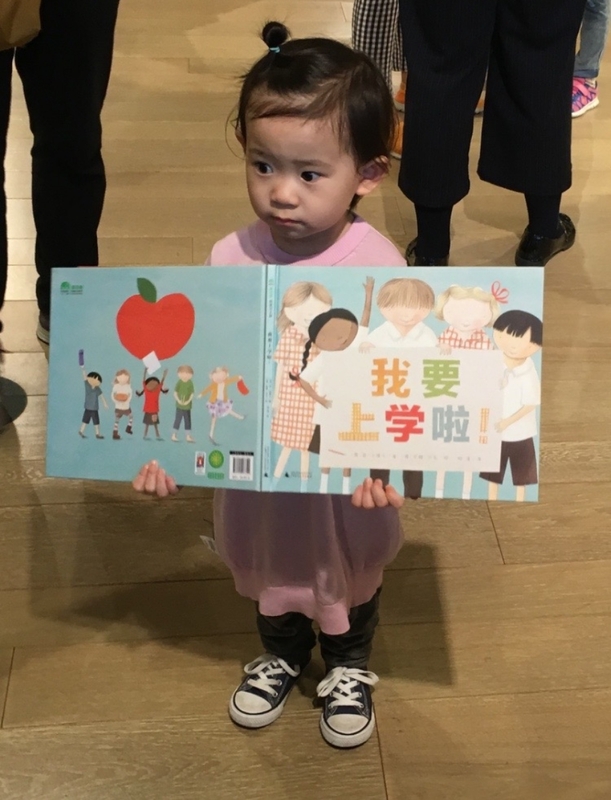 We had an event at Collins Bookshop in Orange which was lots of fun, and we also shared the book we created together, Hattie Helps Out, to kids in libraries and schools along the way. Here are some pictures from the trip. You can see the beautiful Murray River, Lake Mulwala in Yarrawonga, a great little library right on the banks of the river in Barooga, Davina and Ivy at netball, and I even got to photograph some oranges in Orange! You can also see here Freya doing a drawing at Collins Bookshop, and some cut outs of our character Hattie from Hattie Helps Out. During May, June and July, I've been busy out and about working with school students in various parts of Australia. I travelled to Sydney in May, where I spoke with girls at Ascham and SCEGGS, then I had a couple of days in Goulburn where I worked with the kids in schools there. It was lots of fun, and the place where I stayed in Goulburn was right next to the Big Merino! Here's a picture of him! I also spoke at Chairo Christian School in Pakenham and Drouin. It was a cold, foggy morning the day I visited. Here's a picture I took when I arrived at the school, and also some great bear drawings that the kids did. Another school I visited was Moama Grammar in Moama, and also Bunnaloo Primary School which is a small school in New South Wales. It was beautiful country, and I had a great time working with the kids there. When I got home, my beautiful painting from What Do You Wish For? was ready to be collected from the framers. Doesn't it look lovely? My friend and collaborator Anna Walker gave me this piece of original art from our most recent book that we did together. I will treasure it always. During June, I spent a week in Western Australia, working with kids in schools, and then I had the honour of launching a new book by my friend and fellow author Davina Bell. The book is called Oh, Albert! I really love it! It's about a family, their mischievous dog called Albert, and a space-themed birthday party. Here are some pictures from the book launch, which was held at the Paper Bird bookshop in Fremantle. What books am I working on? Well, I'm exploring a new book idea with artist Jane Reiseger. Here's an early picture of one of the characters. And in late July, Davina and I will be travelling back to Orange to see our friend Freya who illustrated our latest book, Hattie Helps Out. I have also just returned from a trip to China! 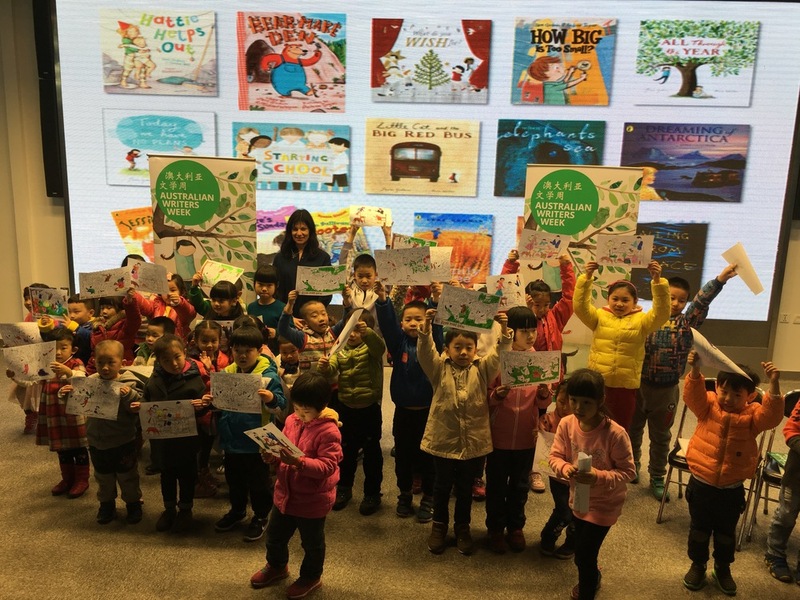 I went there as part of the Australian Writers' Week in Beijing, and I participated in The Bookworm Festival and spent some time with my Chinese publishers, The Magic Elephant Books. Here are a few pictures from the trip.